From sports cars to luxury cars, from foreign elegance to domestic muscle, Great Cars offers an in-depth look at the world's fastest, most expensive, most exciting and most unusual automobiles, along with the people who loved and created them. This contains thrilling, in-depth profiles of these classic sports cars: MUSTANG - The 1964 Mustang created a stampede in American showrooms similar to the frenzy created by the Beatles. 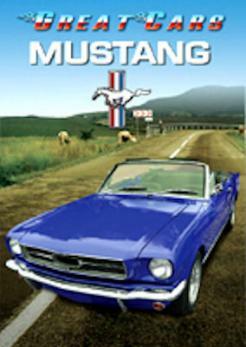 Ford conducted a series of Gallup polls to see what baby boomers wanted in a car - the Mustang was it. Just three years after the Mustang's unveiling at the New York World's Fair, the one millionth Mustang trotted off the assembly line; clearly the Mustang was the inexpensive sporty car the world was waiting for. COBRA - Like a coiled snake, this car scared the world's racing elite and made its creator, Carroll Shelby, a household name. In 1959, Shelby was America's best competition driver but a heart condition forced him to give up racing. Instead of retiring from the circuit he decided to jump back in with his own cars - not an easy feat - and within four years, his dream car was born: the Cobra. GT-40 - In the 1960s a young Ford Motor Company executive named Lee Iaccoca decided that Ford needed to compete with the world's best companies in high performance motor racing. He convinced Ford that they should buy Ferrari. But after Enzo Ferrari sent them packing back to Detroit, Ford decided to beat Ferrari at LeMans, no matter what the cost. Their secret weapon would be the GT-40.